The Republican-led New York State Senate, which for years had a collaborative working relationship with Governor Andrew Cuomo, passed a slew of government transparency and accountability bills on Wednesday that further highlighted the GOP majority’s recent split with the governor. Actor and activist Cynthia Nixon launched her challenge to two-term incumbent Governor Andrew Cuomo by calling him a fake Democrat who has governed like a Republican and only takes progressive stances when they are politically expedient or he has no choice. As the Democratic primary between Governor Andrew Cuomo and Cynthia Nixon continues to heat up, a group of progressive activists is pushing for the state party to change its rules and open up the primary to unaffiliated voters. In 2016, leading up to the presidential election, Democrats criticized Republican candidate Donald Trump’s lack of political and governmental experience while heralding Hillary Clinton’s long career in politics. This year, New York Democrats face a somewhat similar situation within the party given the primary challenge from actor and activist Cynthia Nixon to incumbent Governor Andrew Cuomo. In the 2014 race for governor, when Governor Andrew Cuomo, the Democratic incumbent, was leading by 37 points over his Republican rival Rob Astorino with nearly four months till Election Day, the Republican Governors Association wrote off the loss. 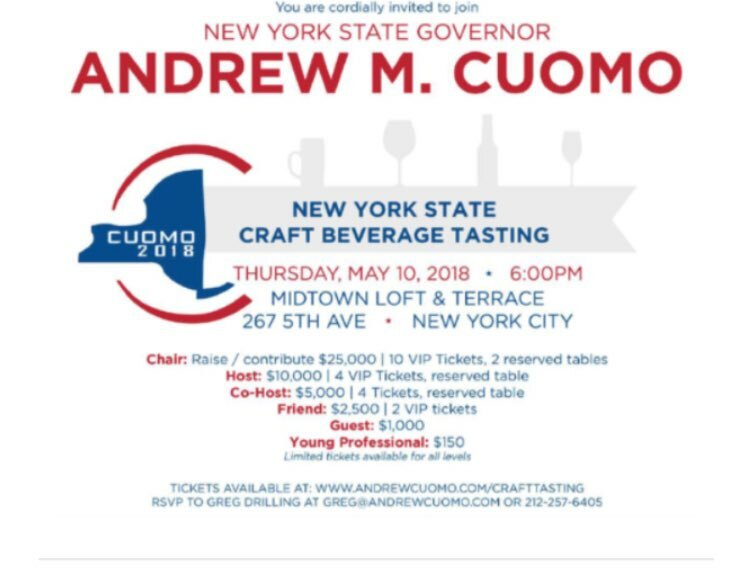 After years of efforts to help beer and other craft brewing businesses grow in New York, Governor Andrew Cuomo is tapping into the industry for an upcoming campaign fundraiser. When the new state budget for fiscal year 2019 passed early Saturday morning in Albany, Governor Andrew Cuomo had successfully implemented several of his top policy priorities on issues like workplace sexual harassment, taxes, gun control, and public housing in New York City. But many of the policies the governor outlined during his January State of the State and executive budget presentations, and indicated he intended to see included in the adopted budget, were left out.